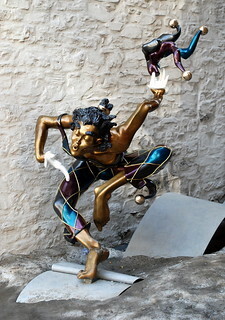 Bronze sculpture of a welcoming court jester on a ribbon (end of ribbon only here) next to the Caisse Populaire Desjardins du Vieux-Québec. Sculpture is entitled Le Grand Bienvenue / Welcome Back and was sculpted by artist Nicole Taillon. A sovereign is returning to his kingdom after a long absence. His jester can hardly contain his joy. Everything in this sculpture evokes the joy of a homecoming, the warm of a welcome. The jester is bowing. Every part of his body is involved in his deep reverence to the newly arrived ruler. One hand is bent in salute while the other is waving a hat. His left leg is poised mid-air, foot flexed, and with the right leg in a pose of exaggerated reverence, even his buttocks seem to be prostrated. In his agitation, he is losing his gloves. But throughout, there is no hint of submission. The Welcome Back figure looks us in the eye, his open face beaming. The road is clear, all is perfect!